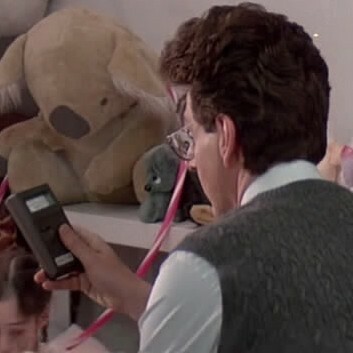 The Monitor 4 Radiation Detector was used by Egon at the beginning of Ghostbusters II. While its exact purpose remains unclear, it appears to be calibrated to monitor emotions instead of radiation. It later appears on both Egon and Ray's belts during the montage. Note the Monitor 4 in a pouch on the left. "The MONITOR 4 is a compact, general purpose survey meter capable of detecting alpha, beta, gamma, and x-rays over 3 selectable ranges. A red count light flashes and a beep sounds with each event detected. Detects alpha down to 2.5 MeV; typical detection efficiency at 3.6 MeV is > 80%. Internally mounted beeper (can be switched off for silent operation). Meter will hold at full scale in fields as high as 100 times the maximum reading. One 9-volt alkaline battery. Battery life is up to 2,000 hours at normal background radiation levels. 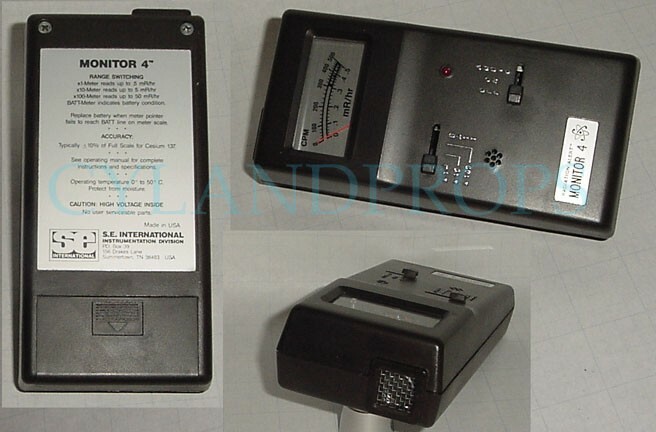 The Monitor 4 is still listed as a rental prop from Modern Props.